The idea here is to the learn the notes on the fretboard. The bottom two (thickest) strings should be learned first. The moveable chord shapes are the same, hence the name moveable. 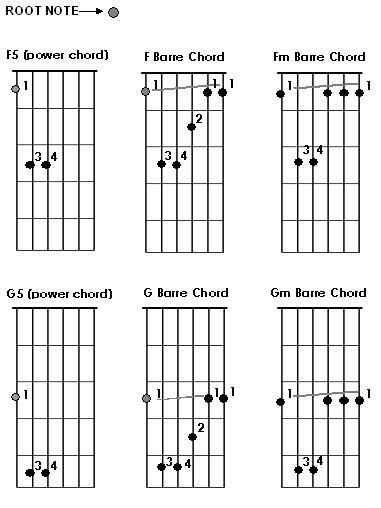 So if you know the notes, you just find the root and make the desired chord shape, a root5 chord for examplet. You will instantly be able to make over a hundred different chords. The key to unlocking the fretboard is simply to learn the notes. Just remember, BC and EF are side by side and all the other notes have a fret in between. You want to lead with your first finger when playing most moveable chords. For example, if you want to make an F5 chord, your 1st finger should go on the 1st fret on the 6th string.That fret would be the root note (F) of that chord. So when making these chords start with your 1st finger and place on the root note. Learning the Notes on the Fretboard is highly advised. It can't be stressed it enough, it opens up the entire guitar. It will make you a better guitarist and able you to learn at a much quicker pace.